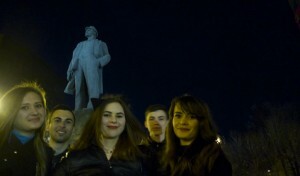 Asia Times’ roving correspondent Pepe Escobar just returned from a reporting trip to the Donetsk People’s Republic (DPR), the pro-Russian enclave in the Donetsk Oblast province of eastern Ukraine. The area’s been the scene of heavy fighting between pro-Russian rebels and the Ukrainian military. I’ve just been to the struggling Donetsk People’s Republic. Now I’m back in the splendid arrogance and insolence of NATOstan. Quite a few people – in Donbass, in Moscow, and now in Europe – have asked me what struck me most about this visit. I could start by paraphrasing Allen Ginsberg in Howl – “I saw the best minds of my generation destroyed by madness”. But these were the Cold War mid-1950s. Now we’re in early 21st century Cold War 2.0 . Thus what I saw were the ghastly side effects of the worst minds of my – and a subsequent – generation corroded by (war) madness. I saw refugees on the Russian side of the border, mostly your average middle-class European family whose kids, when they first came to the shelter, would duck under tables when they heard a plane in the sky. 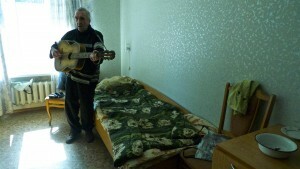 I saw the Dylan of Donetsk holed up in his lonely room in a veterans’ home turned refugee shelter fighting the blues and the hopelessness by singing songs of love and heroism. I saw whole families holed up in fully decorated Soviet-era bomb shelters too afraid to go out even by daylight, traumatized by the bombings orchestrated by Kiev’s “anti-terrorist operations”. I saw a modern, hard-working industrial city at least half-empty and partially destroyed but not bent, able to survive by their guts and guile with a little help from Russian humanitarian convoys. I saw beautiful girls hangin’ out by Lenin’s statue in a central square lamenting their only shot at fun was family parties in each other’s houses because nightlife was dead and “we’re at war”. I saw virtually the whole neighborhood of Oktyabrski near the airport bombed out like Grozny and practically deserted except for a few lonely babushkas with nowhere to go and too proud to relinquish their family photos of World War II heroes. I saw checkpoints like I was back in Baghdad during the Petraeus surge. I saw the main trauma doctor at the key Donetsk hospital confirm there has been no Red Cross and no international humanitarian help to the people of Donetsk. I saw Stanislava, one of DPR’s finest and an expert sniper, in charge of our security, cry when she laid a flower on the ground of a fierce battle in which her squad was under heavy fire, with twenty seriously wounded and one dead, and she was hit by shrapnel and survived. I saw orthodox churches fully destroyed by Kiev’s bombing. I saw the Russian flag still on top of the anti-Maidan building which is now the House of Government of the DPR. I saw the gleaming Donbass arena, the home of Shaktar Donetsk and a UFO in a war-torn city, deserted and without a single soul in the fan area. I saw Donetsk’s railway station bombed by Kiev’s goons. I saw a homeless man screaming “Robert Plant!” and “Jimmy Page!” as I found out he was still in love with Led Zeppelin and kept his vinyl copies. 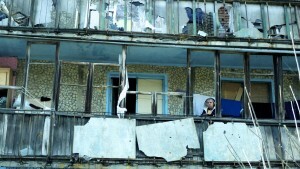 I saw a row of books which never surrendered behind the cracked windows of bombed out Oktyabrski. 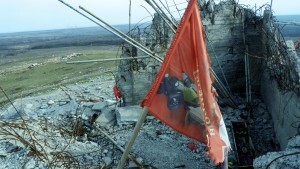 I saw the fresh graves where the DPR buries their resistance heroes. I saw the top of the hill at Saur-mogila which the DPR resistance lost and then reconquered, with a lone red-white-blue flag now waving in the wind. 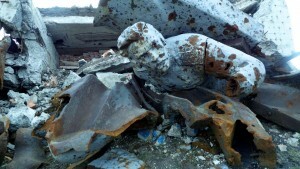 I saw the Superman rising from the destruction at Saur-mogila – the fallen statue in a monument to World War II heroes, which seventy years ago was fighting fascism and now has been hit, but not destroyed, by fascists. I saw the Debaltsevo cauldron in the distance and then I could fully appreciate, geographically, how DPR tactics surrounded and squeezed the demoralized Kiev fighters. I saw the DPR’s military practicing their drills by the roadside from Donetsk to Lugansk. I saw the DPR’s Foreign Minister hopeful there would be a political solution instead of war while admitting personally he dreams of a DPR as an independent nation. I saw two badass Cossack commanders tell me in a horse-breeding farm in holy Cossack land that the real war has not even started. I did not see the totally destroyed Donetsk airport because the DPR’s military were too concerned about our safety and would not grant us a permit while the airport was being hit – in defiance of Minsk 2; but I saw the destruction and the pile of Ukrainian army bodies on the mobile phone of a Serbian DPR resistance fighter. I did not see, as Organization for Security and Co-operation in Europe international observers also didn’t, the rows and rows of Russian tanks and soldiers that the current Dr. Strangelove in charge of NATO, General Breedhate, sees everyday in his exalted dreams invading Ukraine over and over again. And I did not see the arrogance, the ignorance, the shamelessness and the lies distorting those manicured faces in Kiev, Washington and Brussels while they insist, over and over again, that the entire population of Donbass, traumatized babushkas and children of all ages included, are nothing but “terra-rists”. After all, they are Western “civilization”-enabled cowards who would never dare to show their manicured faces to the people of Donbass. So this is my gift to them. Just a howl of anger and unbounded contempt.